The Deanship of Admission and Registration participated in the annual student forum for major selection under the title, "My Major is the Beginning of My Progress," on Thursday, 2 Jumada Al-Thani, 1440 A.H., at the headquarter of the Deanship of the Joint First Year. The deanship was represented by a team from the female section headed by the Vice Dean of Admission and Registration, Dr. Fatimah bint Ali Al-Ghamidi, who was accompanied by Ms. Hanadi Bamaqus from the Department of Academic Affairs and Ms. Sarah Al-Udwani from the Department of Public Relations and Media. Her Excellency the Vice Dean delivered a speech in which she pointed out the importance of these meetings in educating and helping female students to choose the major that suits their abilities and interests. She explained in a video the concept, steps, and conditions of specialization. She pointed out the obligatory transfer and its specific procedures. She concluded her speech by stressing the importance of students knowing their academic rights, and wished them success in choosing their major. After this, the head of the academic affairs department answered questions. The forum was organized by the Deanship of the Joint First Year (Medical Stream) under the supervision of the Vice Dean of the Joint First Year (Medical Stream), her Excellency Dr. Azzah Banunah. The Vice President for Female Student Affairs, Dr. Sarah bint Omar Al-Khuli, attended the meeting. 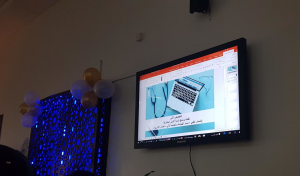 At the end of the meeting, the vice dean extended her thanks and appreciation to the affiliates of the Deanship of the Joint First Year (Medical Stream) for this educative initiative for female students. This participation is part of the community partnership between the Deanship of Admission and Registration and the Deanship of the Joint First Year.